This is Mortimer the dragon. He is the mascot of Mordiford Primary School. Mortimer is a very well travelled dragon because he has been involved in 3 Comenius projects, a UKIERI (India) project and now a new Erasmus+ project. 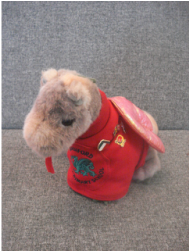 Mortimer likes to collect badges of the flags of the countries he has visited and then pin them on his school jumper. Some of the badges he has are from: Sweden, France, Spain, Turkey, India, Northern Ireland, Ukraine and Italy. Mortimer is looking forward to meeting lots more pupils from our partner schools as he always enjoys a cuddle. This is our mascot. He has just been born for the project KA2. We have been working on emotions and feelings with the help of the tale ‘The Colour Monster’ by Anna Llenas. The story of a sweet monster who wants to explain how he feels and uses colour to do so. Children love this so sweet protagonist and we have made our own COLORINES at school to help children open up and discuss how they feel, even when their thoughts are confusing. He is green as it represents the calm we all need to be positive. Colorines is looking forward to meeting you all and your mascots!!! 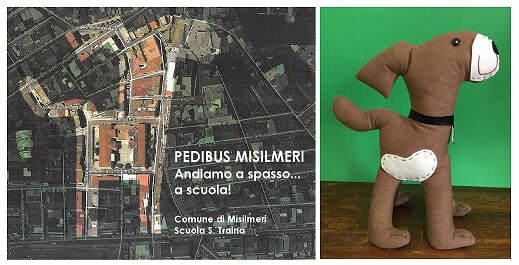 Our mascot will be a walkbus-shaped dog as showed in this map representing our walkbus itinerary established in cooperation with the local administration. The "pedibus"will start in a short time. We're just waiting for approval and... Our mascot, with its particular shape, will remind us the importance of keeping in fit by practising physical exercise. This is St. George, our mascot at St George's, funnily enough! He is so special in England he has a day named after him, on the 23rd April. He is very fearless, having fought a dragon, and is looking forward to many adventures abroad. He accompanies us when we go on field trips and sporting events. We hope that he brings us good luck. This is Bolek, the white eagle. ​He is named after the patron of our school, King Bolesław Chrobry. Bolek is a new addition to our school. He's still learning the ropes and scouting his new realm. These are Karagöz and Hacivat. They are famous shadow puppets. It is said that, once upon a time they lived in Bursa-Turkey. This is André, our big owl. ​He's very curious and a very good listener. He likes to play and help us learn.